This may be one of the most important articles on this website. “Why?” you ask. Well because the most vulnerable human beings to Radio Frequency (RF) Radiation is our kids, especially our babies. Their heads and skulls are still forming and firming up. And their skulls are thinner. They are just much smaller than adults. It does not take as much to hurt an infant than it does a 250 lb full grown man for example. Our children are our most precious members of our society and we want to protect them. The subject of baby monitors and their safety is very important. There are hundreds of peer reviewed scientific studies linking RF Radiation to cancer. Even the World Health Organization classified RF Radiation as a “possible carcinogen”, which means “cancer causing” in 2011. And baby monitors are not just a subtle emitter of RF Radiation. They are one of the largest sources of this radiation in the average home. Unlike a cellphone which only emits at full power when sending and receiving phone calls, baby monitors emit at full power constantly 24/7, whenever they are turned on. And what makes it worse is that most parents are completely unaware and place their baby monitors very close to where the baby is sleeping. If you are in a hurry and want to skip the beginning part of this article and jump right down to my 7 recommended lower emission baby monitors, here is the list with links to where I provide more details. To get back to this list remember all you have to do is hit your browser back button. The below video is one of a series of videos where I filmed myself going through a home and testing each room of a home for RF Radiation. In this video I run into a baby monitor in one of the kid’s bedrooms. My goodness do they emit a ton of RF Radiation. It maxed out my meter from the bedroom doorway. This is a short video but I highly recommend you take a moment and watching it. Seeing is believing. Before we go any farther into this article let me make one very important suggestion. 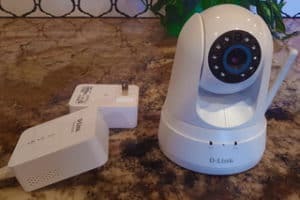 If after reading articles like the ones on this website, you do still decide to use a baby monitor, you will want to go with one of the safer ones like I describe below. And along with that there are other items that you can use to both protect your baby from the baby monitor, as well as from other radiation emitting appliances within your home. I have links to the best places to get some of these types of items on the “Recommended Protections” page of this website. I highly recommend that you take the steps to reduce the radiation from all of the devices in your home emitting radiation, not just the baby monitor. If you go with any baby monitor other than a 49 MHz one like the Safety 1st Crystal Clear Audio Monitor I show below, you will want to put your baby monitor into a metal mesh basket of some kind to protect your baby from the RF Radiation it does emit. On the left and the right are images of the two baskets I recommend. 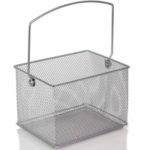 Here are the links to these two where I get them on Amazon: Steel Mesh Waste Basket and Steel Mesh Condiment Caddy. A 49 MHz baby monitor is low enough of a frequency that it is pretty darn safe just as it is. So I wouldn’t worry about doing this for those baby monitors. But the other ones you do want to. In the below video I show what I am talking about. 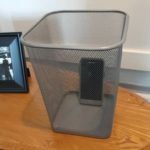 I demonstrate how to use these steel mesh baskets to protect your baby from the baby monitor. It is ironic that what inspires most parents to want to use a baby monitor is a desire to protect your little one and keep them safe. Yet most people would not lay their baby down inches away from a microwave oven while they were heating up dinner. I have asked parents that question and they are adamant that they would never do that. Yet I have measured the radiation coming out of our microwave oven, and the microwave ovens of my married children. And Microwave Radiation is RF Radiation. Baby monitors, just like cell phones, smart meters and WiFi Routers, emit this RF or Microwave Radiation, the same as a microwave oven uses to cook food. The amperage is different, but it is the exact same radiation. I am going to get technical for a few seconds. This is important so please try to stay with me. If you look at the below chart you will see what is called the “electromagnetic spectrum”. When electricity gets to a high enough frequency that it becomes airborne, it becomes electromagnetic radiation. Radio Frequency or RF Radiation is electromagnetic radiation from the frequency where electricity becomes airborne, and includes all of what is shown in the below chart as the “microwaves” part of the spectrum which ends at about 300 gigahertz frequency. When you get into really high frequencies you get into things like x-rays and gamma-rays. In the Radio Frequency portion of this spectrum, the higher the frequency, the more dangerous it is to us. A typical microwave oven operates at the 2.45 GHz frequency. Most WiFi things in our homes such as cell phones, WiFi routers, Bluetooth, cordless phones and baby monitors all use 2.45 GHz frequency just like a microwave oven. Because there are so many devices using that frequency now, they are starting to make WiFi Routers also operate at 5 GHZ frequency, which is twice as high. The new 5G technology that everyone is so excited about will use between 24 GHZ and 90 GHZ, or 10 to 36 times higher of a frequency. 5G will be ultra high frequency and ultra high intensity compared to 2G, 3G and 4G technologies. But my main point is that the typical baby monitor operates at the exact same frequency as the typical microwave oven. The amperage levels the devices use are different, but the radiation that they emit are the exact same. What Makes A Baby Monitor “Low Emission”? My best advice would be to just not use a baby monitor. Or make your own by hard wiring a microphone and a video camera into your baby’s room, so it is not using WiFi at all. That is by far the safest option. If you can’t make your own, and must have a baby monitor, remember the lower the frequency of a radio wave, the less dangerous it is to us. So the lowest frequency baby monitors are the old analog baby monitors that use to operate at around 49 MHz, which is the same as .049 GHz. This is much lower than the 2.45 GHz most digital baby monitors operate at. The only problem is fewer and fewer companies make analog baby monitors that use that low of a frequency. (I do have a link to one that is still being made in my list below.) They need higher frequencies to offer the extra convenient features. This would be the best option next to not having a baby monitor at all. The next best option is to use a digital baby monitor that offers “Eco-Mode”. The Eco-Mode feature when turned on will stop the baby monitor from emitting any RF Radiation unless activated by motion or sound. Every time your baby makes a noise or wiggles he or she will be blasted with the same radiation as your microwave oven uses, but at least it won’t be emitting radiation when the baby is quite and still. The 7 baby monitors following I have not personally tried so to be transparent I cannot vouch for them. I have researched them and read multiple reviews on each one and will attempt to give you a good summation of what I have found. My hope is this might save you some time as you do your research. Be sure and click on any image or link to check out the prices and to get review information from Amazon. This is my first choice merely because it is by far the safest. Not only is it analog but since it has such a low frequency at 49 MHz, it is much safer. 49 MHz is a lower frequency than FM Radio! It has a range of about 600 feet. It has 2 channels to minimize interference. It comes with the normal convertible belt clip / carry loop so that you can carry the receiver around with you. And it has an audio jack for listening with earphones. The reviews on this baby monitor were a mixed bag. Some said it worked wonderful and they could hear everything great. Other complained of static and said it was very annoying to use. I do know that with analog baby monitors sometimes other electronics in the home can interfere with its sound quality. This one seems to be no exception. I have heard good things about the safety 1st company, but this is a fairly inexpensive unit. If this functions well for you and serves its purpose properly, since this runs on such a low analog radio frequency this would be much much safer for your baby than a digital monitor and the RF radiation they put out. This Sony BabyCall Analog monitor is my second choice if you must have a baby monitor. I haven’t tried it myself, but based on the things I have read this is the next one I would would get. The 900 MHz is quite a bit higher than I would like but at least it is still analog and not up in the microwave range. It is close though, only 100 MHz shy. The microwave part of the spectrum starts at 1 GHz. The reviews on this model are the best out of all of the baby monitors I reviewed. With that and the fact that it is analog are the main reasons I would choose it. I really like the fact that not only does it have batteries that it can run on, but that they are rechargeable. And you can plug them in as well. That’s cool. The unit is “water resistant”, but don’t go dunking them in the kids bathwater. That will ruin them for sure. Another feature I really like is that it has 27 channels for clear transmission and minimum interference. The reception and clarity is much better than all of the other analog baby monitors that I have read about at least according to their reviews. It has senses and indicates when the receiver is out of range, when your baby makes any sound and when the battery is low. This unit has 3 alarms available (acoustic, visual, vibration), which is handy. And it comes with a night light as well. Whenever you get into WiFi appliances like this they usually blast way more energy out than is necessary. For example as many of you hopefully saw in some of my other articles the WiFi internet router guard. A WiFi Router Guard still allows WiFi internet to go through your home even though it cuts out 90-95% of the radiation and signal. I know because I have my router in a router guard and my son still does his homework on his laptop using WiFi and has not complained yet of his signal strength or speed. The same will be true of this baby monitor. This monitor has a range of about 2650 feet. That’s great right!? Not really. Huger overkill. What it means is it is blasting tons of RF radiation to carry the signal that far. And people put that in their baby’s room? Yikes. If I tested it with a meter it would max the meter out for sure. So here is the good news. There is such a thing as a WiFi Router Guard. Get one and stick this baby monitor in it. Then you have two protections. The first is that it is voice activated and so you only get a blast of radiation when the baby cries (I still would test that to be sure with a meter). And the second is you can stop 90-95% of the radiation when it does blast. The reception would still be good and it will still do everything like it is supposed to. It just might not go 2650 feet. Big woop. Most monitors only go 600 to 1000 anyway and that is plenty. It is better than cooking your children with microwave radiation isn’t it? I would not buy this myself, but I included it for the techy junkies that have to have something like this. At least this might be a little better for your baby. The only reason I included it is because it claims to direct less radiation towards the baby, 10 times less than it directs in other directions. But it is still emitting full blast in other directions. This model has smart features without the harmful DECT technology. And it has video recording. The data is encrypted which is nice. Safety is more important to me than any of these features. It does have a nice tip-proof portable stand. The drawbacks is it is a bit more pricey than a lot of other models. But sometimes you get what you pay for. Since my main concern is safety it did seem to me like it might have had more bells and whistles than it really needed. And then the whole idea about the directional antenna I would have to test to believe. I would have to get the meter out and test it myself before I would trust my child with it. And I would have to either have a way to shield the radiation from going where I didn’t want it to go or not have anyone living in the direction the antenna was pointing too. RF radiation goes through walls like they don’t exist. Okay here is another analog baby monitor. I really believe if you have to have a baby monitor, analog is by far the safest. Even though with this model you won’t be able to see your baby, since it is analog, you will be able to hear when he or she wakes up and cries. It has some pretty cool features. 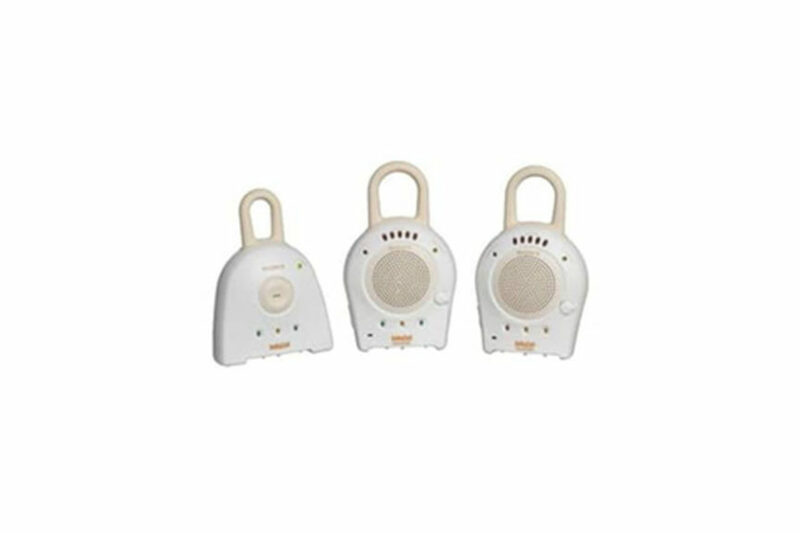 It has lights that allow you to pick up sounds from your baby’s room, and you can see the intensity of the sound through the sound level lights on the baby monitor. This is especially helpful if you are watching TV or doing something noisy yourself. At a glance you can see what the noise level is in your baby’s room. That’s handy. The range on this baby monitor is 600 feet. This monitor comes with two AC adapters. It also works on battery for backup purposes. It is lightweight and very portable. The monitor alerts you when it gets out of range so that you know to move closer to your baby’s room so you can be in range. And again you have the sound level lights so you can see if it is too noisy to hear. This is a bit more on the expensive side for analog monitors but the reviews indicate you might be getting what you pay for. It’s not perfect. Some people still complain about some buzzing and occasional interference or feedback at times. This video monitor claims to put out no electromagnetic radiation at all. It is feature rich. It has things like a temperature gauge, a nightlight, two way communication, a motion detector and video recording. The review however seem a bit all over the map. Some love it and some don’t like it and say it is not reliable in some areas. It claims to have unlimited range. It has a video recording feature with motion detector which is cool and it is IOS and Android compatible. The complaints that some people have had is that the app doesn’t work correctly, the temperature gauge is inaccurate and the picture is a bit fuzzy. One thing I have noticed is that there are so many more options and models of smart baby monitors. The analog and low emission digital just are not in as much demand so there is less to choose from. Hopefully this will be solved over time as more and more people learn about the dangerous microwaves these devices put out. I like this device because it gives you the best of both worlds: digital video when you need it, and two options for lower emissions. 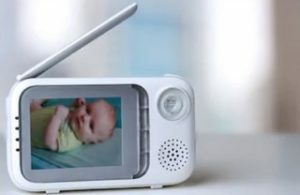 This digital video baby monitor uses FHSS technology but is sound-activated, which cuts down on electromagnetic emissions simply because the device doesn’t always need to be powered on. It also gives you the option to use an audio-only mode. So, you get a encrypted , secure connection with a high-resolution video screen when you need it, and an voice-activated or audio-only feature when you don’t need a constant video stream. According to reviews this model is very reliable. It did have some negative reviews but over all it seemed mostly favorable. I like that it has an encrypted connection. That is less important to me than physical safety but it still is a nice feature. The video and audio transmission sound like they were on the higher quality end based on customer reviews. It is voice activated which will reduce emissions. And it has an audio only mode which will keep it safer as well. It has a range of almost a thousand feet. And it will monitor the temperature of the baby’s room. Not a big deal in my book but what the heck its another feature. The downside is it blasts RF radiation because it uses FHSS technology when the video feature is activated. And I noticed on some of the reviews some people complained of static at times. After researching all of these different “low emission” baby monitors what I realized really fast is that their is a lot of junk out there. There are some good ones too but you have to search through a lot of junk to find the good ones. And the thing I think is the most important is that buying a baby monitor is only one part of an overall strategy to reduce your overall radiation exposure. That is why I can’t stress enough how important it is to pick up the meters. I really recommend that everyone not just read this article, buy a low emission baby monitor, and call it good. You have a lot of other things in your home emitting this same radiation. I really recommend buy the two meters I show on the Recommended Protections page of this website so that you can test your entire home for both RF Radiation, and Dirty electricity. If you have friends that already have the meters then you can borrow theirs. But testing your home room by room for both types of radiation is the only way that you can really know what you are dealing with, (every home measures a bit different) and make educated decisions so you can reduce your whole house down to safe levels. Once you measure the radiation in your home for yourself you can see where you have a problem and you can easily put together a strategy to keep your gadgets and not be exposed to the dangerous cancer causing radiation. There are many cool items that allow you to keep your gadget but that protect you from the harmful RF radiation. Please also see our articles entitled “Are Wired Baby Monitors Safe? (Low EMF) – Get The Facts!“, “How Safe Is A Voice Activated Baby Monitor?”, “Are Baby Monitors Safe or Dangerous? Here are the Facts.” and “Is Bluetooth Harmful To Babies“. Hi! I’m David. Several years ago I read an article about the harmful effects caused by RF Radiation. This led me to an in-depth study of the subject. As I read the findings of many scientific studies I was flabbergasted that more people did not know about this. I bought some meters and began testing my own house and then researching ways to correct the issues I found. This website grew out of that research. Now it is one of the most trusted sources to learn about RF Radiation. This site is owned and operated by Cornerstone Concepts LLC, a limited liability company headquartered in Idaho, USA. 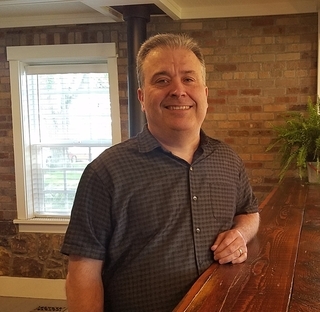 Cornerstone Concepts LLC is a participant in the Amazon Services LLC Associates Program, an affiliate advertising program designed to provide a means for sites to earn advertising fees by advertising and linking to Amazon.com. Cornerstone Concepts LLC also participates in affiliate programs with SmartMeterGuard.com, LessEMF.com, and other sites. Cornerstone Concepts LLC is compensated for referring traffic and business to these companies. Hi! I’m David. About 4 years ago I read an article about the harmful effects caused by RF Radiation. This led me to an in-depth study of the subject. As I read the findings of many scientific studies I was flabbergasted that more people did not know about this. I bought some meters and began testing my own house and then researching ways to correct the issues I found. This website grew out of that research. Now it is one of the most trusted sources to learn about RF Radiation. Is 5G Harmful to Our Health?